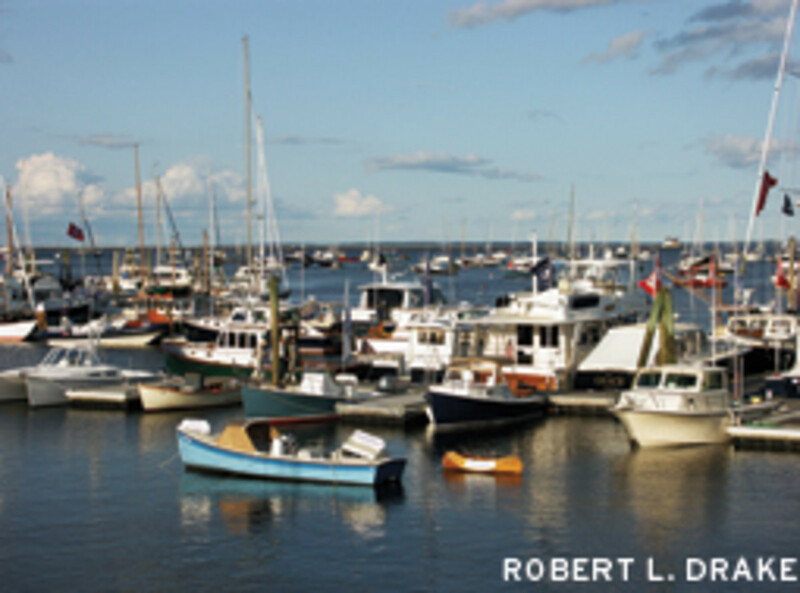 A spacious protected harbor, complete boating services, maritime industries and a growing number of great places to eat and fun things to do have transformed Rockland from a gritty commercial fishing port to a fascinating stop for boaters. Rockland’s lighthouse, on the mile-long granite breakwater, marks the harbor entrance from Penobscot Bay, Maine’s premier cruising grounds. 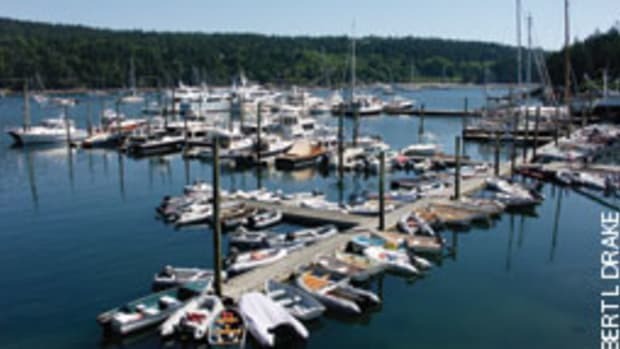 You’ll find an anchorage (just inside), and moorings and dockage at Rockland Public Landing or the town’s eight marinas — Sharp’s Point South, Trident Yacht Basin, Landings Restaurant and Lounge, Journey’s End Marina, Beggar’s Wharf Marina, Knight Marine, The Apprenticeshop and Ocean Pursuits. Launch service, commercial shipyards, marine construction firms and a seaweed processing plant are also harborside. The Public Landing sits in Harbor Park, at the head of the harbor, a block from downtown Main Street. 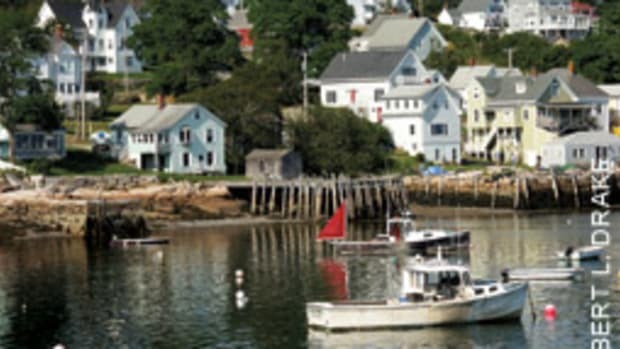 Harbormaster Ed Glaser, former owner/captain of the windjammer Isaac Evans — (207) 594-0312 — welcomes cruisers with helpful local knowledge. 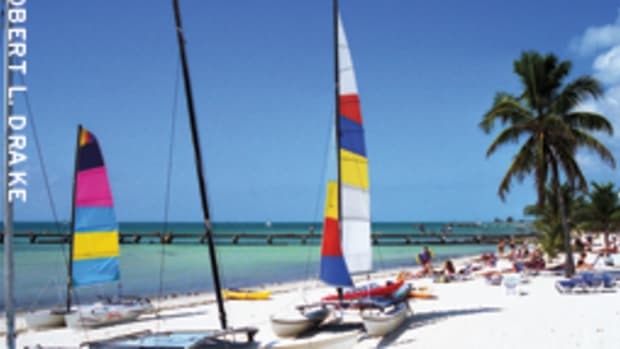 Take some time to sit on deck and watch the other yachts, windjammers, tugs, island-bound ferries, sightseeing craft, commercial fishing boats, local lobster boats and Coast Guard vessels home-ported here. 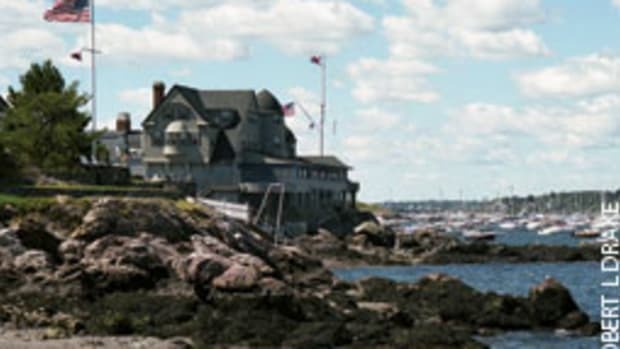 Rockland Yacht Club’s fleet, The Apprenticeshop’s sailing classes, Station Maine’s gigs and exotic ethnic boats built by Lance Lee’s apprentices also may be sailing. Ashore, Rockland rocks in the summer. The annual North Atlantic Blues Music Festival (July 13-15) features musicians performing in Harbor Park and pubs along blocked-off Main Street. 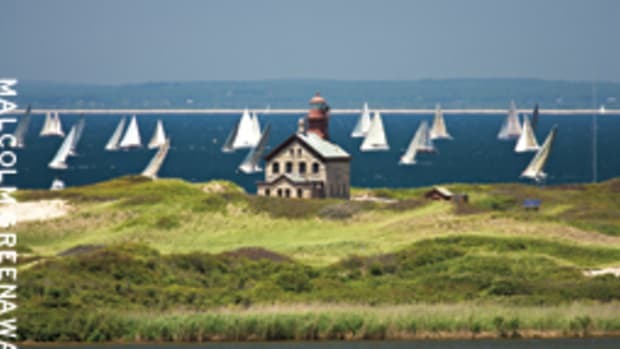 Friendship Sloops gather and race during their annual rendezvous (July 19-21). The king of crustaceans reigns at the annual Maine Lobster Festival (Aug. 1-5), when more than 20,000 pounds will be served. 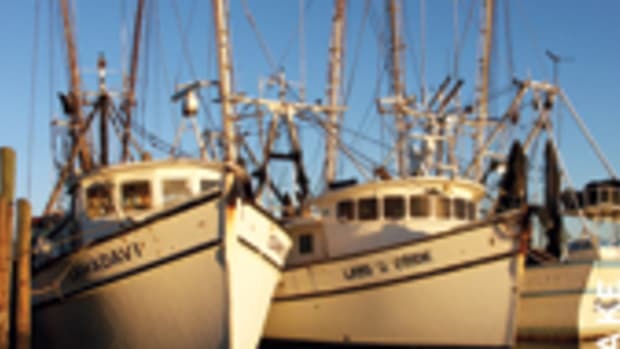 The Maine Boats, Homes & Harbors Show (Aug. 10-12) fills the docks and Harbor Park with boats, food, music, art and vendors of the accouterments of coastal living. On any day, you’ll find much to do downtown. 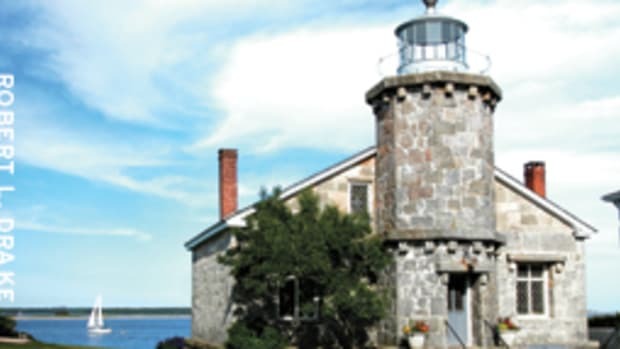 The Lighthouse Museum displays the largest collection of Fresnel lenses in the country and artifacts rescued decades ago by Ken Black, when the Coast Guard was discarding outdated lighthouse gear. The 1923 Strand Theatre offers films and live performances. The Project Puffin Visitor Center’s video cameras show the birds nesting on offshore islands. The Farnsworth Art Museum and Wyeth Center exhibits its nationally recognized collection of works by America’s greatest artists, particularly the Wyeths — N.C., Andrew and Jamie. The museum also offers tours of the Olson House (frequently painted by Andrew Wyeth) and its renovated 19th-century Farnsworth Homestead. Among downtown’s coffee shops, bakeries, galleries and boutiques are more than 50 restaurants, from Wasses Hot Dog Stand and Home Kitchen Cafe to a growing number of Zagat-acclaimed fine dining establishments serving international cuisine. Primo often tops the list. Near the marinas, Hamilton Marine stocks a vast variety of nautical gear. The supermarket, Walmart and Home Depot require a bicycle or cab ride. Settled in 1769, Rockland boomed in the mid-1800s from shipbuilding and the lime industry. Entrepreneurs made fortunes excavating local limestone from 12 quarries, burning it in 125 kilns, then shipping the slaked lime in more than 300 wooden vessels to Northern cities for making cement. Plaques along the 2-mile Harbor Walk mark the former shipyards, lime wharves and support businesses. Harborfront benches and a small swimming beach are pleasant respites near the former Snow Shipyard, location of The Coastal Children’s Museum and the Sail, Steam and Power Museum. 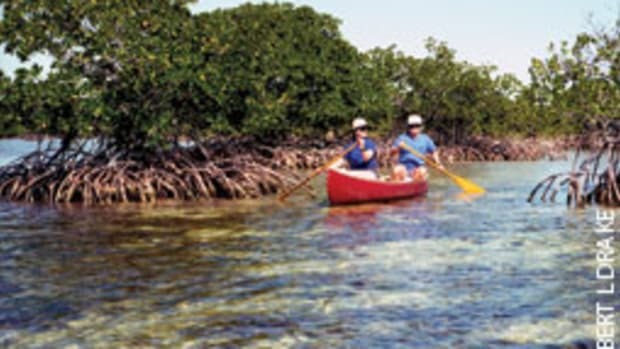 All these activities will keep you busy for days — or necessitate a return cruise.